My first reaction to seeing the screens, which were not guaranteed when I made my reservation, was “Oh boy! This flight is going to be fun!” Once settled in my seat I looked up to a blank monitor. Mine was the only screen on the entire plane not working! My reaction was a little intense for a minute. My body went into full fight-flight mode. Could I sue the airline? Demand an upgrade to first class? The degree of frustration was a wee bit alarming. Where was this coming from? Our society is so conflicted, now more than ever, it seems. Mindfulness is preached as the soothing balm to the pressures of every day life. Yet we are made to feel we will miss something of life and death importance if we don’t have a smart phone that can search for the latest restaurant while we simultaneously talk over dinner plans with our spouse. I just think I am not alone in struggling with the proper balance between using these wonderful tools and giving in too much, allowing them to use me. When I lost the solitaire app on my iPod I resisted the urge to re-install it because I spent too much time on that thing. I’m still going through withdrawal. What is the anti-dote to too much technology? Mindfulness maybe? Mindfulness is the ability to open the entire body, all the senses that are available to us, mind, body and spirit to the miracle of Being. 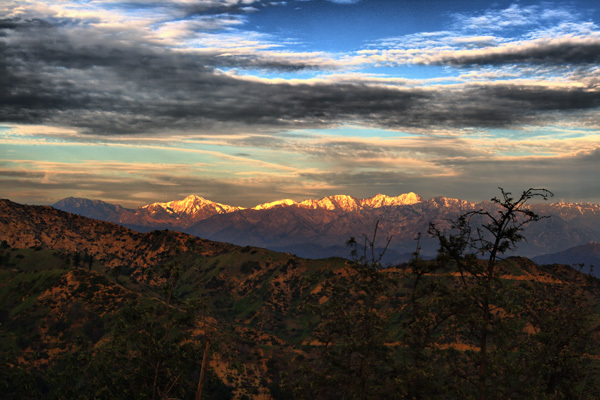 Right now in this moment I am witnessing the sunrise over the San Gabriel mountains. The sunlight slants into the East facing window. Everyone in the house is asleep; it is quiet. Once in a while a birdie sings. I made coffee. The taste and smell of it lingers. The air is cool on my cheek. Restful, I am content. This article was originally published in Fenruary 2010. Mindfulness is a very appropriate reaction to today’s techy world. I don’t think it is any wonder that these century old skills are being re-introduced to our modern world. Good piece! Thank you, Steven. I appreciate you stopping by. I love a working console on overseas flights. They make the time go much more quickly. That being said, I understand where you’re coming from. I’ve been trying to take a break from most technology for at least the majority of one day each weekend.I not only get more done, but I don’t feel as bogged down. When Is It The Right Time To Break Up?